Earn and Use Brilliant Distinction Points! We Know You Love it! Sign-up to get offers delivered to your email. Get offers and updates to make you Feel Beautiful! Your information is safe. We don't share. Adds fullness and plumps thin lips. Restore natural fullness, enhance naturally thin lips or get noticeable volume-It’s up to you. Vollure is our newest addition to our service menu. Especially engineered to soften moderate to severe lines and wrinkles around your nose and mouth. Benefits last up to 18 months. As you age, it’s not just about lines and wrinkles. Voluma can provide you contour and a subtle lift for up to two years with optimal treatment. We are excited about the benefits patients will enjoy. Volbella adds subtle volume to the lip area for the treatment of lines around the lips. It is the first and only filler proven to last up to 1 year for lips and vertical lines. Effective and safe treatment to permanently remove chin fat, improving patients profile image, even if you gain weight. Many patients are significantly improved after just one treatment. Latisse can grow your lashes longer, darker and fuller! It’s not an illusion of growth. It’s your own eyelashes — only better. The process is safe and effective with little or no downtime. Photorejuvenation appointments are quick, and you can return to work or other activities — looking and feeling beautiful! Palomar Pulsed Light Systems offers a permanent solution for unwanted hair. Concentrated pulses of light loosen the hair and disable the cells responsible for new hair growth. The treatment is performed by a professional, certified technician who has been trained to identify the different types of skin growths appropriate for treatment. Our desire is that you feel beautiful. Aspire Medical Aesthetics offers medical grade skin care products to keep looking and feeling radiant. Carol and Michelle are amazing!! From laser hair removal to Botox, my mother and I have never been disappointed! We highly recommend Aspire. It’s a clean and friendly shop! Thank you for always providing the best services!!! I’ve been getting my Botox here for years and they always do a great job. Michelle and Carol are wonderful, professional ladies. Thank you so much Carol! I recently made an appointment to get a little enhancing done for the holidays. I had never been to Aspire Body Enhancement before, but they came highly recommended. Carol was wonderful….this had to be one of the best experiences I have ever had. She had the eye for exactly what I needed. I put my trust in her and she did not disappoint. A lot of pictures were taken prior to my services. When I returned for my follow up a couple weeks later, I was surprised at the differences. I actually have had several people say, “you look good, what are you doing”, I’ll never tell. The décor of the place is beautiful. Thank you so much Carol, you and your place are wonderful. Came here for Botox and possible lip filler. Michelle was very nice, took a lot of “before” photos which helped because we could really concentrate on the areas that we both felt we should focus on. I was extremely nervous about the pain, but she gave me an ice pack for the Botox needle and pain was minimal. I ended up getting lip filler and she put a numbing creme on my lips for 30 minutes, then an additional application before putting in the filler. Again, pain was minimal. Michelle and Carol are the best in the business. Sweet, professional and skilled at all of their services. I have been coming here regularly for Six years. I get all types of services but I love the Photo Facial, it helps remove brown spots and provides overall even skin tone. All of my friends always compliment me on my skin. I always refer them to Aspire! I love supporting local business and these girls are Top Notch! Very happy with the results. I appreciate the fact I didn’t feel pressured to buy more services! Great service & pricing for laser hair removal…definitely recommend. Carol has done it twice for me now. I’m in the process of getting laser hair removal and it is going great! I already notice a huge difference in my hair growth. The women who work here are very sweet and knowledgeable also. This place is great and the girls (Rn’s) working here are very professional and helpful, I love my results and am going back for more soon. I’ve been going to Michelle and Carol for 6 years for Botox and photo facials. I have always been pleased with the results (unlike other med-spas I’ve been to). In fact, I have since moved out of state and still plan my appointments with them around my visits back to So. Cal. to visit family. Click on store front image to get directions! 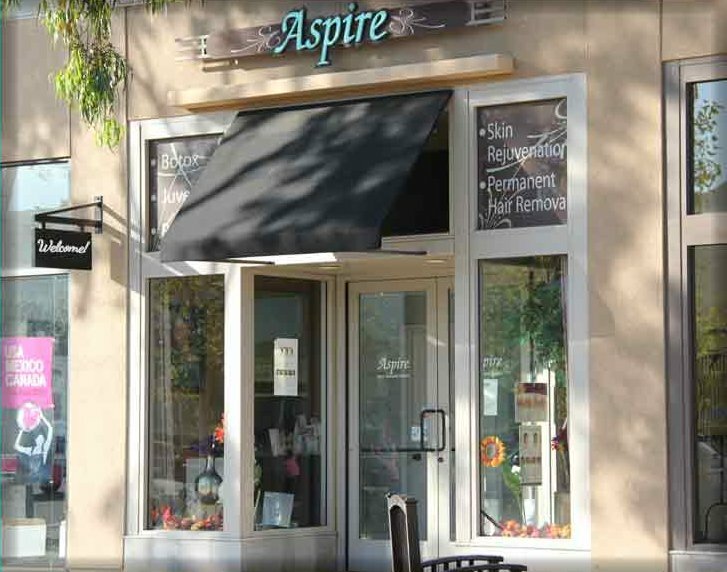 Aspire Medical Aesthetics treatments are provided by owners and registered nurses, Carol and Michelle. Both nurses work under the supervision of a licensed physician. With over 40 years of experience in various specialties within the medical field, they remain committed to the highest standards in the industry. Their goal is to provide clients with a less invasive alternative to plastic surgery, as well as a caring and compassionate environment that puts customer satisfaction first. The business has grown steadily since 2006 due in large part to the partners’ adherence to integrity and top quality service. Sign up to Get Beautiful Offers in Your Email. Your information is always safe with us. We Don't Share.